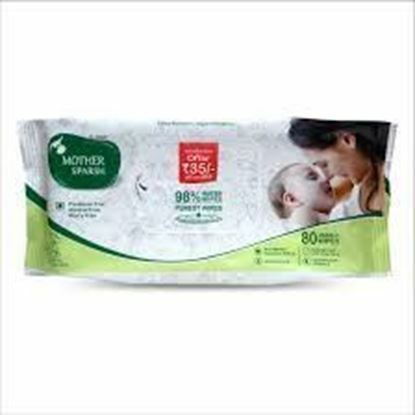 Information about Mother Sparsh Baby Water Wipes Mother Sparsh WaterWipes are formulated specifically for your baby’s supple, soft & delicate skin. These are the only wipes that contain 98% pure water and aloe vera extract a natural moisturizer. 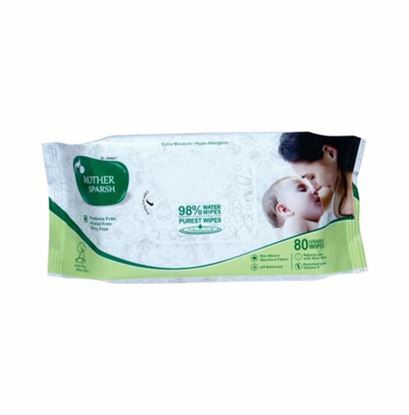 Mother Sparsh Water Wipes don’t irritate skin instead it cleanses your baby’s sensitive skin without causing uneasiness, allergy, and infection. It is also helpful in preventing diaper rash caused due to skin irritation and bacterial infection. Benefits of key ingredients: Jojoba oil: Natural cleanser, helps in removing dirt from the skin, moisturize the skin naturally and remove dryness. Aloe vera extract: Natural anti-oxidants, helps to keep natural firmness of the skin. Acts as the moisturizer & soothes the skin, helps in relieving from inflammation, itching, irritation & blistering. Vitamin E: Effectively forms the protective layer over the skin, helps in maintain skin firmness by inducing fine collagen lines formation. Directions of use: Peel front label slowly, Take out the wipes as needed, Reseal front label after each use to prevent moisture loss.